This is an integrated, single-source reference for undergraduates majoring in food science and nutrition, postgraduates, and professional food scientists and technologists working in the functional food area, and medical and health science professionals interested in alternative medicines and natural food therapies. PETER C.K. CHEUNG, PhD, is the Director of Studies for the Food and Nutritional Sciences Programme in the Department of Biology at the Chinese University of Hong Kong. Professor Cheung is the author or coauthor of more than 150 publications (including journal articles, patents, technical papers, and conference abstracts). He is a current member of the editorial board of the International Journal of Medicinal Mushrooms and a member of the advisory committee of the Journal of Agricultural and Food Chemistry and a member of the board of Journal of Food Composition and Analysis. 1. Overview of Mushroom Cultivation and Utilization as Functional Foods (Shu-Ting Chang). 1.3 Concept of Mushroom Biology and Applied Mushroom Biology. 1.7 Development of World Mushroom Industry Movements. 2.4 Functional Genomic Approaches for Gene Expression Analysis. 3. Nutritional Value and Health Benefits of Mushrooms (Peter C.K. Cheung). 3.2 Wild and Cultivated Edible Mushrooms. 3.3 Production of Cultivated Mushrooms. 3.7 Health Benefits of Edible Mushrooms. 4. 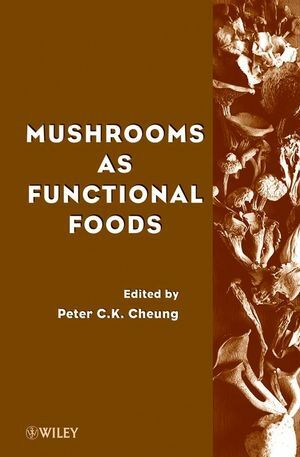 Sclerotia: Emerging Functional Food Derived from Mushrooms (Ka-Hing Wong and Peter C.K. Cheung). 4.2 Concepts of Mushroom Sclerotia. 4.5 Cultivation of Mushroom Sclerotia. 4.6 Biochemical, Nutritional, and Technological Characteristics of Mushroom Sclerotia. 4.7 Biopharmacological Values of Mushroom Sclerotia of P. tuber-regium, P. rhinoceros, and W. cocos. 5. Antitumor and Immunomodulatory Activities of Mushroom Polysaccharides (Vincent E.C. Ooi). 5.2 Antitumor Polysaccharides from Mushrooms (Higher Fungi). 5.3 Mechanisms of Antitumor Action of Mushroom Polysaccharides. 5.4 Structure and Antitumor Activity Relationship of Polysaccharides. 6. Regulatory Issues of Mushrooms as Functional Foods and Dietary Supplements: Safety and Efficacy (Solomon P. Wasser and Eden Akavia). 6.2 Legal and Regulatory Issues of Introducing and Controlling Dietary Supplements from Medicinal Mushrooms in Different Countries. 6.3 Safety and Diversity of Dietary Supplement Types from Culinary-Medicinal Mushrooms. 6.4 Submerged Culturing as the Best Technique for Obtaining Consistent and Safe Mushroom Products. 6.5 Experiences of Seven Countries in Consolidating Their Food Safety System.